Caption 1: Members of the City of Leeds team who will be attending the G Star Diving Championships this weekend. Caption 2: Cliff diving champion Gary Hunt in action. 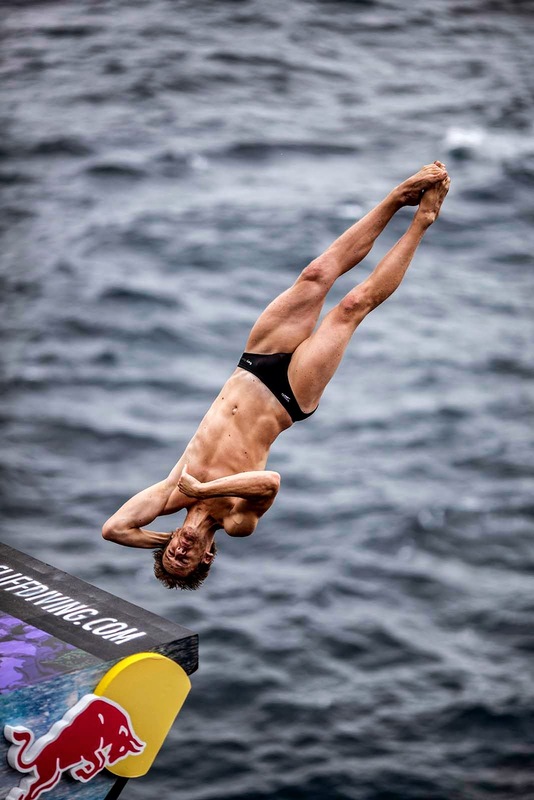 Top diving stars from across the UK will be joined by one of the world’s best cliff divers at a special invitational event in Leeds this weekend. Hosted by the City of Leeds diving team and also featuring teams from South Africa and the USA, the G Star Diving Championships will take place at the John Charles Centre for Sport this Friday, Saturday and Sunday. Glasgow 2014 Commonwealth Games gold medalists Jack Laugher, Chris Mears, Rebecca Galantree and Alicia Blagg will take part alongside City of Leeds teammates James Denny, Yona Knight-Wisdom. Also at the event will be Leeds’ newly-crowned British champion Lois Toulson, who last week won the women’s 10m platform title at the GB Diving Championships in Plymouth at the age of just 15. And they will be joined by Red Bull world cliff diving champion Gary Hunt. Cliff diving is a form of traditional high diving which sees athletes take part in competitions across the world. Gary, 30, a four time world champion, learned to dive in Leeds and will be presenting the Gavin Brown Trophy to the event’s top diver. “This will be an incredible showcase of some of the world’s best diving talent and it’s a real testament to Leeds’ national and international reputation in the sport that we’ll be hosting so many amazing athletes. “Just last weekend, our divers returned from the GB Championships with 19 medals, a fantastic accomplishment for our team and our city. As part of this weekend’s event, elite divers will also be attending a series of autograph sessions after their dives. Chris Mears and James Denny will be meeting fans on Friday from 4pm-5pm with Alicia Blagg, Yona Knight-Wisdom and Jack Laugher appearing on Saturday from 4pm-5pm. Rebecca Gallantree and Gary Hunt will be signing autographs on Sunday from 3pm-4pm. “It’s a huge credit not only to our divers, but our coaches and the facilities we have in Leeds that we will be hosting an event that will feature so many exceptional athletes. “The last few years have seen our incredibly talented team of divers go from strength to strength, and they continue to set the standard for others and make us all very proud. This weekend's event is free for members of the public to attend.